Modern plastic snap rat trap is a modification of ordinary mechanical wooden traps that have existed since Adam was a boy. They are molded from tough, non-absorbent polystyrene. As to the action mechanism, they resemble a cat’s jaw. Thus, they have a special powerful, aggressive, though easy-to-use, design. In fact, Swissinno SuperCat, Tomcat rat snap trap, Trapper T-Rex Rat Trap by Bell, Langxun Kill Rat Traps, JT Eaton 410 Jawz Large Plastic Rat Trap with High Tension Spring for Solid or Liquid Bait are powerful and highly effective. The Tomcat Rat Snap Trap is easy to set in one motion with a hand or foot. It has proved to be highly effective for rat extermination. Beside, Tomcat rat trap has patented interlocking teeth that are impossible for rats to escape. The trap also comes with a removable bait cup. Plastic mechanical traps are ideal for capturing the occasional rat or as part of a more extensive control program. They can be used indoors and outdoors in the rat-infested areas. They are placed along walls, in crawlspaces, in holes and corners or wherever rodents live, breed and roam. 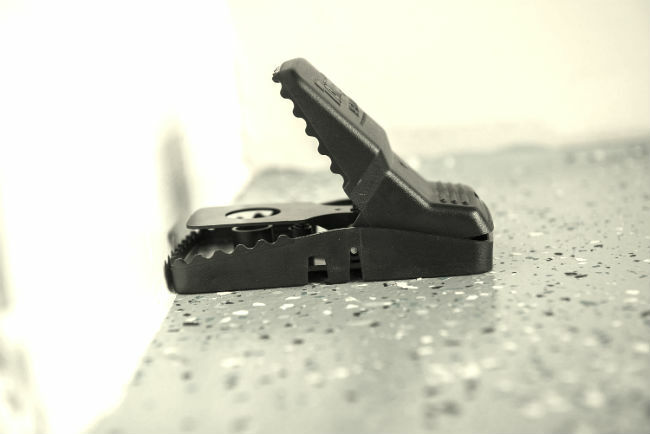 Plastic snap rat trap offers the increased capturing power with no false triggers. Moreover, their trigger mechanism is more precise and responsive. In practice, they are really faster and easier to set than traditional wood-and-metal traps. In addition, they contain an integrated bait cup to hold a rat attractant or bait, thus providing better results. The polystyrene construction of modern snap rat traps is durable, reusable and washable. They don’t absorb odor and stains like old-fashioned wooden traps do. It means that you can apply them regularly for a week and more. Then, the plastic latch that holds the trap in the set position will wear smooth. Plastic snap rat trap kills a rat immediately and cleanly without breaking the skin. Thus, no blood, mess, or smell. It holds the attracted rat tight with 35% more force than other mechanical traps. First, inspect your house thoroughly looking for the signs of rodent activity. Then, you should identify the pest and determine the target area. Mouse traps are not able to catch or kill a rat. Thus, use only special polystyrene traps for rat removal. For better results you may use lots of snap traps at 10 feet internals. Fetch some food or rodent attractant for the bait. Twist the bait cup clockwise bottom of a trap. Place the treat or attractant into the bait cup and re-insert it into the trap to lure rats. At last, set the traps by pressing top portion (containing ridges) to the bottom with your foot or hand until it clicks into position. Place the rat snap traps perpendicular to a wall or other structure where rodents run and forage for a meal. Never touch the captured critter, it may be hazardous. 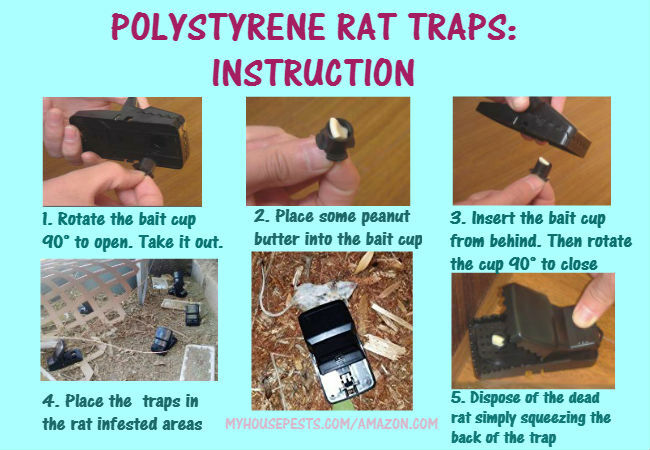 Simply dispose of the rat by holding the plastic snap rat trap over a trash receptacle and squeezing the back of the trap.